WLR is pleased to announce that it has commissioned James Armitage Architects to produce an indicative masterplan and design ideas for the Windsor Link Railway. James Armitage specialise in traditional and classic architecture and they are part of the Prince’s Foundation for Building Community Professional Network. This means they are well-placed to understand Windsor’s special status, as an internationally famous historic town and as a home as well as the needs and preferences of local residents today. The output of this work will enable local residents to get a better understanding of what is proposed, both as block models and photo-realistic, CGI (computer generated images). 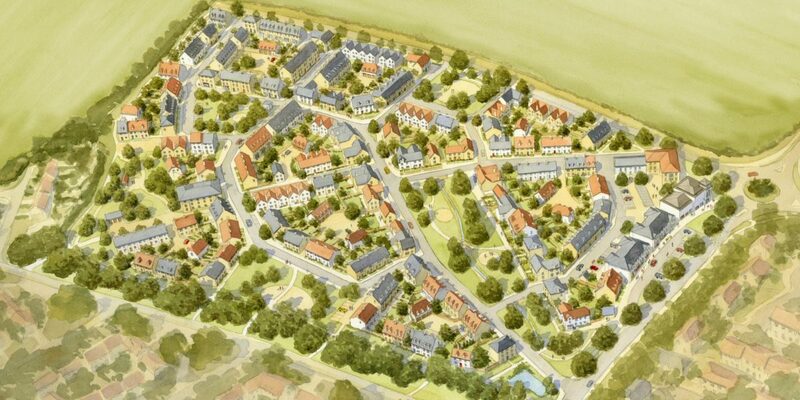 The first image above illustrates a previous project by the practice: a masterplan for a settlement on the edge of Cambridge undertaken in conjunction with the Prince’s Foundation for Building Community. The second image shows Park Street today, which like some of the other best streets in Windsor, could be the inspiration for the architectural style to be used. The actual designs for WLR will be based on what local people want, using an Enquiry by Design process. Subject to the agreement of the council, this could be held later this year.